Dehydration is a very common cause of hospitalization in older adults. Although it is always important to stay hydrated, it is particularly important to make it a priority as we age because older people are especially prone to suffering from the serious effects of dehydration. This is due to several factors, including a decrease in body water content and as the result of medications. Dehydration can lead to a myriad of health conditions, including constipation, low blood pressure, urinary tract infections, confusion and even worse. Dehydration is especially problematic during the summer months because warmer temperatures increase the risk that the elderly will suffer from heat stroke. 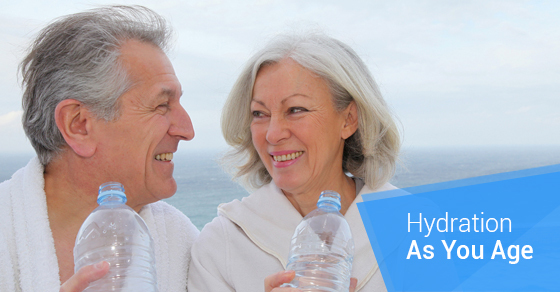 Here are some tips to stay hydrated as you age. Keep water bottles (or a water cooler) easily accessible. For example, if you tend to spend a lot of time in your living room, have water bottles within reach. Consider putting your daily recommended amount of water in two separate water bottles. At the halfway point on the water bottle, write 12p.m. By 12p.m, you should have had at least half of your required recommended water intake for the day. Do the same thing on the other water bottle. Writing the time on the water bottle will act as a visual reminder. Ensure that you drink eight ounces of water every time you take any type of medication. Make water more enjoyable. Since some people don’t enjoy drinking plain water; you can make it more appealing by adding fruit slices such as strawberries. Add the fruit slices to your water cooler at night so that the flavours have time to infuse into your water. Make mocktail (non-alcoholic cocktail) versions of your favourite beverages. Caregivers should regularly offer their patients fluids. C-Care Health Services offers a variety of affordable, personalized and high-quality services. Contact us today.